The arrival to the legendary Órbigo puts an end to this part of the hike. The Camino finally moves away from the noise of traffic. The pilgrim thus returns to tranquillity but also says goodbye to flat terrain. The arrival to Astorga, along leg breaking terrain is the perfect prelude for the journey to come. Following six kilometres at the side of the N-120, the pilgrim reaches one of the most magical places on the Camino of Santiago. The tranquil and beautiful Hospital of Órbigo, its legendary bridge, and its people, deeply passionate about trout fishing, it is worth dedicating a few hours to this location. At the exit of the village there are two possible options. Firstly the route that continues straight ahead until arriving to the outskirts of Astorga, along a path parallel to the N-120. The second option is a route that turns to the right it is a couple of kilometres longer, somewhat more demanding, but much more peaceful and visually attractive. Passing through a good handful of hamlets, well nourished with services for pilgrims. With the exception of the exit for San Martín del Camino, in which the pilgrim passes a small stretch of woodland area, the first six kilometres are very similar to yesterdays, a track parallel to the N-120, but with two exceptions. On this occasion the route runs along the right hand side of the road that connects Astorga with León and later takes the pilgrim close to the river Órbigo where vegetation becomes more frequent. At some stages, the path itself sprouts greenery. Having passed these 6 kilometres, the Camino abandons the road to join some dirt tracks, which lead to a cement road. From here the first buildings of the Hospital de Órbigo are visible. Just at the exit from this place the Camino offers once again two possibilities. Either continue alongside the N-120, straight ahead, or move away from the traffic and noise to visit small and charming villages, for this option, turn right. The latter is a few kilometres longer than the first. Both routes meet at the junction of Santa Toribio, before reaching San Justo de la Vega. The majority of pilgrims opt for the latter. A comfortable stroll along working fields and through Villares de Órbigo, a small location with a hostel, chemists and the publicised bar Piris, with its terrace situated in the centre of the village. Villares has a XVIII century church with a baroque altarpiece dedicated to Santiago the Great, patron of the town. At the exit, a narrow path leads to a picnic area with a fountain and outdoor barbecue facilities. The Camino of Santiago goes up an earthy path, on occasions somewhat stony with beautiful landscapes of great contrasts between greens and browns. The path joins the local road and descends to arrive in Santibáñez de Vildeiglesias. Before entering, a new picnic area on the right offers rest to the pilgrims. In this village of León, aside from a social bar next to the hostel, there are no services for pilgrims. The bell tower of Santísma Trinidad Church dominates the whole residential centre. Inside they will find magnificent carvings of saints, of which the one that stands out the most is that of San Roque as a pilgrim. This calm town receives around a million tourists, from a number of countries every year. It is all down to its labyrinth of corn, one of the biggest in the world. Every summer a new maze is offered to visitors. The origin of its activity is directly related to the Camino of Santiago. Especially given the common opinion that the board game Oca, (a popular game, similar to snakes and ladder) is based on the Jacobean route. In this way, Santibáñez represents square number 42: the labyrinth. Another curiosity regarding Santibáñez is its underground fountain, situated close to the church. To exit Santibáñez the walker initially travels on an earthy path, full of pebbles. After so many kilometres on flat terrain, the leg breaking terrain returns. The perfect appetiser for what follows in the next stages. The steep slopes alternate with descents and the terrain is stony at times. Below the shade of a tree, a humble picnic area seems like the ideal place to stop and refuel, although the proximity of an avant-garde pilgrim sculpture is a little intimidating. After this beautiful yet arid passage, the Casa de los Deseos, house of desires, feels like an oasis in the desert. David, a young Catalan decided to dedicate his life to the service of pilgrims. For this reason he chose to rent an abandoned barn. From a restored ice cream cart, he offers pilgrims fruit, juices, lemonade... for nothing in return. He explained on his blog that the owner of the barn wanted 24,000 euros for the property, which he was unable to pay. With the help of the foundation La Casa de los Dioses (house of gods), he accepted donations of one euro in order to meet the payment. Now on flatter terrain, the route comes to the junction of Santo Toribio, from this point on the stage walkers can see Astorga. It is also here that the two possible routes from Hospital de Órbigo connect. According to legend, the Celtic king Teodorico sent his armies in the year 465 to the northwest peninsular to motivate the exile of many Christians in the area. 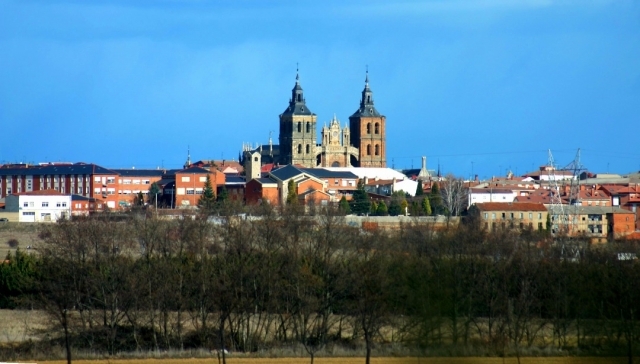 Toribio, at that time the bishop of Tui, sought refuge in Astorga, the city in which he had previously been bishop and where he was falsely accused of murder. It was not well received. At the point where there now stands a stone cross, it is said that he shook his sandals while muttering the phrase “In this land, not even the dust”. He then continued his march. In a sign of regret, they decided to place this stone cross. Every year, in the first week after Easter Sunday, the locals of San Justo de la Vega climb to the top of the hill and deposit a stone and a wish. The pilgrim faces a steep descent to San Justo de la Vega on rather stony ground. San Justo de la Vega is a village situated at the gates of Astoria, just a few kilometres away. Here they will find all kinds of services. San Justo de la Vega passes straight along the side of the N-120. On exiting walkers will cross a bridge over the river Tuerto. A few meters later you take a dirt track on the right hand side. On flat ground the pilgrim passes warehouses and some private homes until reaching a four-storey footbridge. After crossing the railway line they arrive at a roundabout at which they turn left. The last slopes until reaching the centre of Asorga, it is not easy. The majestic bridge over Órbigo is on uncomfortable terrain for those travelling on two wheels. To continue the Camino, in Satibáñez cyclists should turn right before reaching the church. At this crossroads, now on favourable terrain, those cycling too fast are in danger of missing the turn off. There is a descent down a very stony area between Santibáñez and San Justo de la Vega, before reaching the crossroads. In San Justo de la Vega the Camino is shared with road vehicles, thus extra precaution is required. 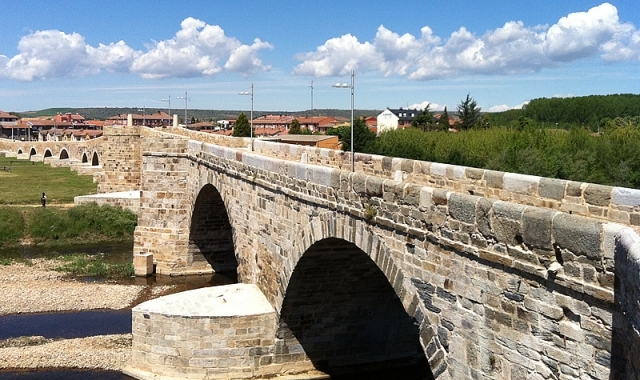 There is a railway footbridge just before reaching Astorga. The slope to entre in Astorga is devil like. 1 reviews Distance to Santiago: 260 km. 1 reviews Distance to Santiago: 276 km.